Well, it’s official. Tonight will mark the final pick of 2014 on our Sonoma Mountain estate for the 2014 harvest season. It’s been a short, busy, sometimes brutal but very rewarding harvest. We are thankful to our Harvest Crew, our Winemakers and Benziger Partners for all their hard work, sleepless nights and sore muscles. These are our Rock Stars and we value each of them and their hard work. Although it was a tough week of bringing in some of our best Cabernet from the Estate, it was also incredibly rewarding. In our last harvest update, we talked about how we are wrapping up our third straight harvest of above-average quantity and quality in our grapes. This week, it seemed we were being smiled upon by Mother Nature AND the Baseball Gods. Both who saw fit to give us one hell of a show. 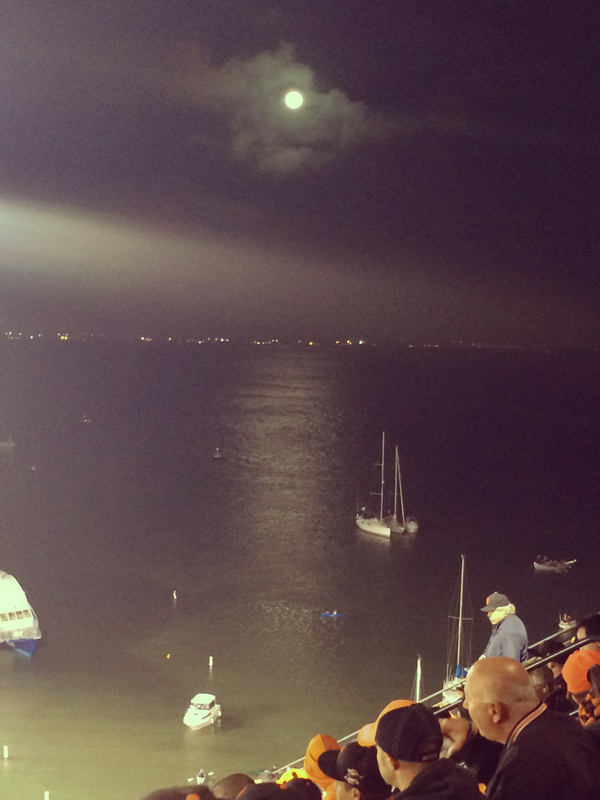 The moon was shining bright on McCovey Cove Tuesdsay night. 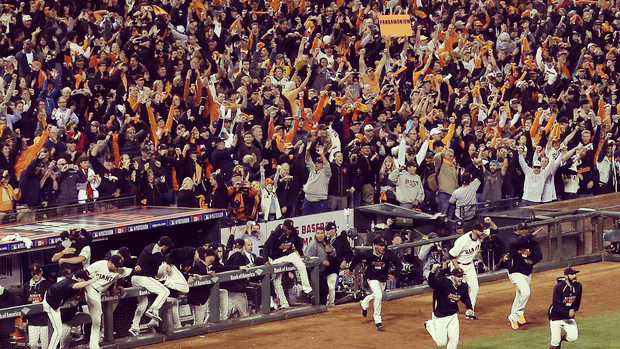 This love of the Giants and the excitement of wrapping up harvest made for an exciting Tuesday night. The Giants beat the Washington Nationals to go to the National League Championship Series in the same night that we were picking some of the Estate Cabernet that will craft the 2014 vintage of Tribute. Some of us were at the game in San Francisco, swinging rally towels and dancing in the streets, some of us were catching the game on TV before heading to the ranch for night harvest. Mike Benziger went to the game, and then went to night harvest. All in a night’s work. As if this wasn’t enough excitement, around 4 a.m. on October 8th, just hours after the Giants victory, Sonoma experienced the second Blood Moon of 2014. A Blood Moon is a total lunar eclipse in which the moon appears red rather than dark. Much of our Biodynamic Farming is based around lunar phases so this was a special event for us and a great night to pick grapes. Also, the moon was almost the size of a “super moon” in which the moon looks incredibly large and it was an especially clear night so this was an impressive event for us. Those who witnessed it thought it looked “Giants Orange”. We are hoping it’s a sign of victory for the pending series against the Cardinals. As always, thanks to you all for your support of the winery and those who came out to take tours and see us crushing grapes and making wine. We truly love this busy, stressful, rewarding time of year and we are grateful for the daily reminders the vineyard gives us about how much power nature has over our business and our daily lives. We hope to see you in soon as we’ll still be fermenting, barreling, aging, blending and having a great time making wine and watching baseball in the coming weeks. Tagged baseball, biodynamic, blood moon, Cabernet, giants, harvest, lunar, Orange October, san francisco, Tribute, wine, wineryBookmark the permalink.